Book Review: 'Giraffes On Horseback Salad' When Salvador Dalí met Harpo Marx, he was so infatuated that he wrote a treatment for a surreal Marx Brothers film, Giraffes on Horseback Salad. The film didn't fly, but this graphic novel does. The Strangest Movie Never Made! Of the two men, Dalí seems to have been the most infatuated. He wrote to André Breton, "I'm in Hollywood, where I've made contact with the three American surrealists: Harpo Marx, Disney and Cecil B. DeMille." 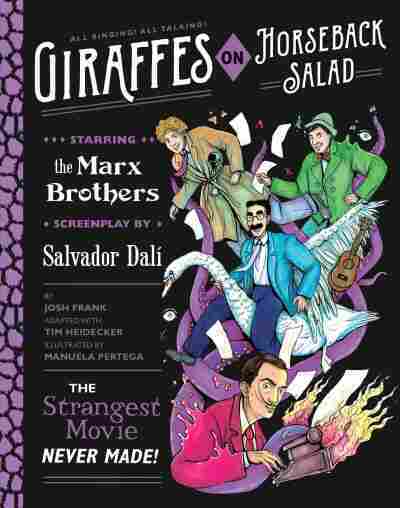 So overcome was Dalí with Harpo's genius that he wrote a treatment, and later an abbreviated screenplay, for a Marx Brothers movie to be called Giraffes on Horseback Salad. He and Harpo even pitched it to Louis B. Mayer. But as Frank puts it, "The meeting did not go well." Among Dalí's ideas: "Harpo opens an umbrella and a chicken explodes on all the onlookers. He ... puts each piece [of chicken] carefully on a saddle that he uses as a plate, a saddle not for a horse, but for a giraffe!" The surrealist script fell flat even with Groucho Marx, who said simply, "It won't play." Eighty years later, Dalí's idea still won't play. Even jazzed up with jokes by Tim Heidecker (a modern Marx Brother if there ever was one), Giraffes on Horseback Salad — the movie, not the book — is a baffling mess. Neither Dalí or Harpo seems to have realized that their approaches to humor were vastly different. The Marx Brothers' work was acutely conscious of, and responsive to, established structures: They subverted the social order using its own rules. Groucho and Chico's wordplay exemplifies this, and even Harpo's silent antics acknowledged conventions in order to upend them. Dalí, more often than not, simply headed off in a direction orthogonal to accepted reality. As a result, he's not generally particularly funny at all. Some of his creations have a lightness — the spindly-legged elephants, his collaborations with designer Elsa Schiaparelli, his own kooky image — but usually his surrealism is deadly serious. That funk of portent permeates Giraffes on Horseback Salad like a vapor. Dalí's movie doesn't really have a plot. One bizarre set piece gives way to another, all heavily symbolic and none eliciting mirth. Dalí even manages to make Harpo unfunny, casting the other man as ... Dalí. "Harpo will be Jimmy, a young Spanish aristocrat who lives in the U.S. as a consequence of political circumstances in his country," Dalí wrote. The artist even meant Harpo to spend much of the film in a tux, his fuzzy mane tamed. It may not be a good story, but 'Giraffes on Horseback Salad' makes a good book. All this would make for a terrible book but for the power of comics — and the virtuosity of Spanish artist Manuela Pertega. Her approach is classical, with only moderate reliance on cartoony distortion. It's a good style for reproducing the visions of a rigorous draftsman like Dalí. Pertega infuses Dalí's elaborate tableaux with all the glamour and mystery he could have wished for. Two-page spreads of overflowing images — a white silk tunnel, flaming giraffes, clusters of disembodied hands, swans, floating fried eggs and a few inevitable lobsters — are improbably harmonious. Pertega's color sense is controlled. Snatching hues from all over the spectrum, she doles them out sparingly for maximum impact. Much of the book is in black and white — a nod to the 1930s setting — making pages with over-the-top color explode more powerfully. It may not be a good story, but Giraffes on Horseback Salad makes a good book. Frank's tale of how he found Dalí's script and organized the project — enlisting the help of Heidecker and the Pixies' Black Francis, whom Frank worked with previously — is entertaining cultural history. His descriptions of Dalí striving to make his mark in Hollywood are funny, too. The great artist may not have "gotten" humor like he thought he did, but in this book he's comical in spite of himself. Etelka Lehoczky has written about comics for The Atlantic and The Los Angeles Review of Books. She tweets at @EtelkaL.